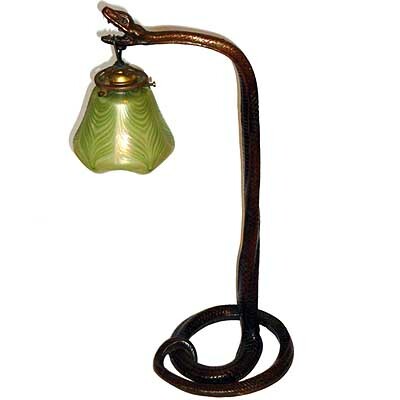 Rare Art Nouveau gilded bronze lamp modelled as a naked maiden reclining and draped in ivy by Eduard Thomasson c1900. 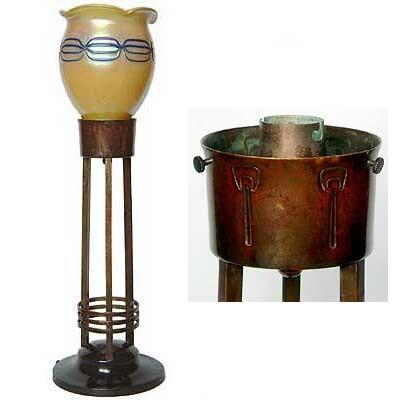 Marks: E. Thomasson, Terseleer. 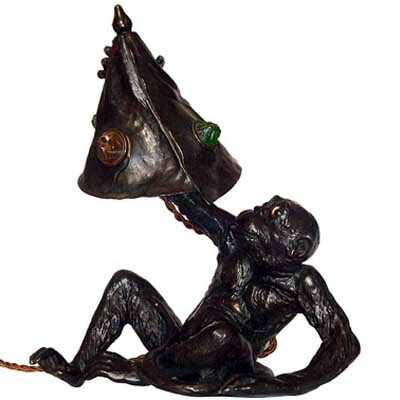 Editeur. 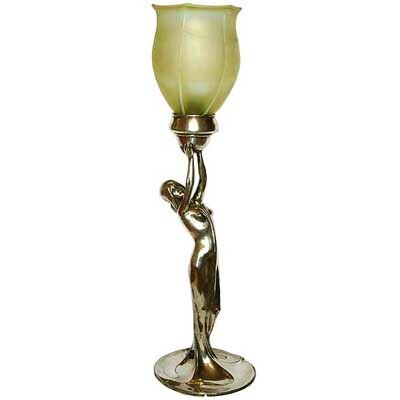 Original Art Deco spelter and marble figural lamp with original crackle glass shade, France c1930. 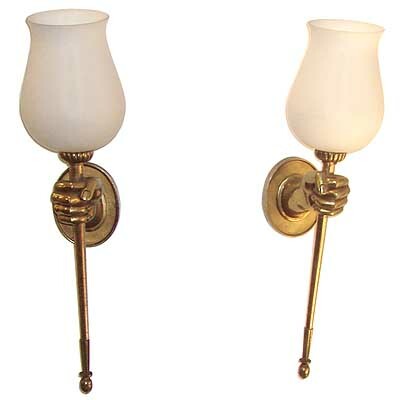 Note: These sconces appear to have been made to take electric light fittings and have professionally made threaded holes to the candle holders and back plates. 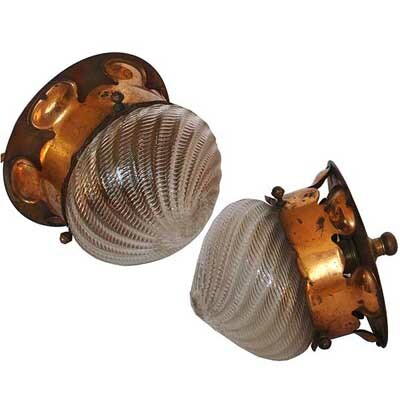 They could very easily be re electrified for use as wall lights. 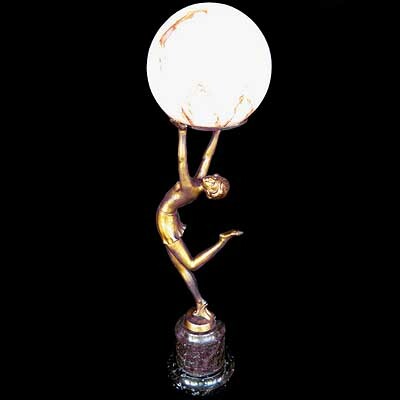 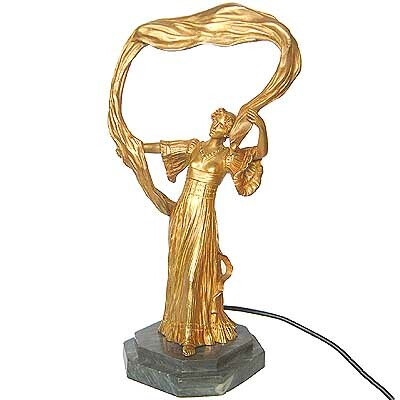 Impressive Art Deco bronzed spelter, marble and glass figural table lamp by Max le Verrier, France c 1930. 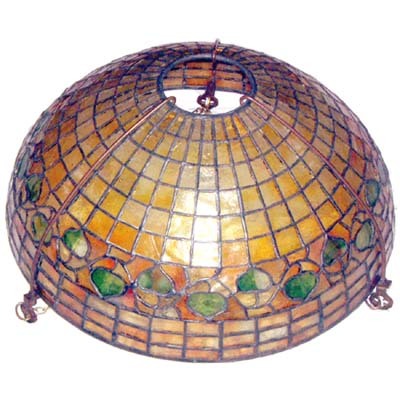 Original glass shade. 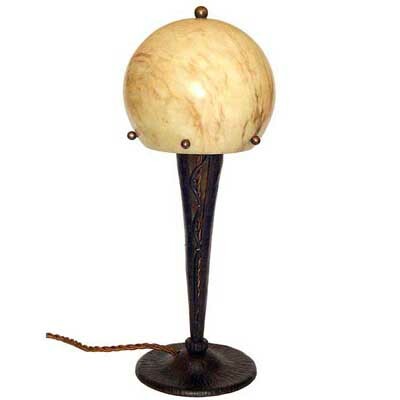 Art Deco bronzed spelter and marble table lamp, France c1930. 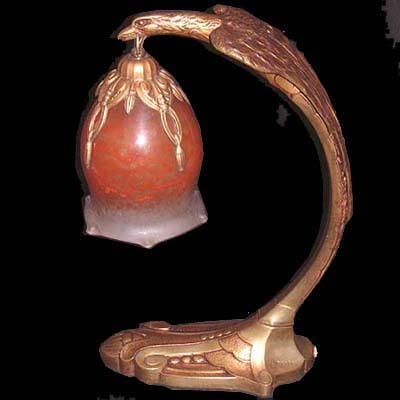 The red marble seat contains the light element which gives a lovely warm mood light. 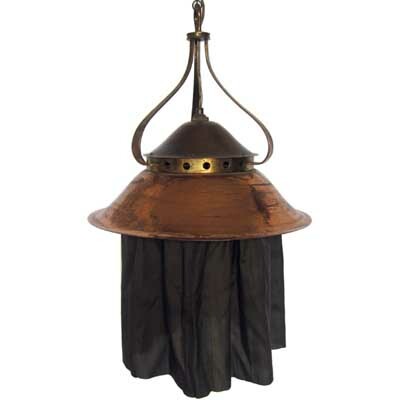 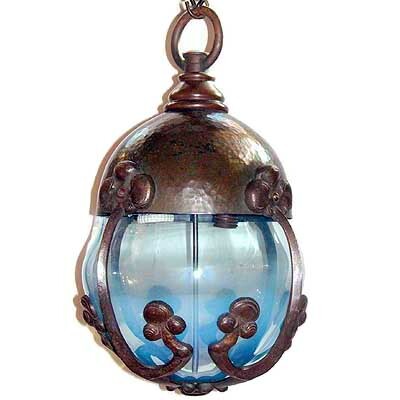 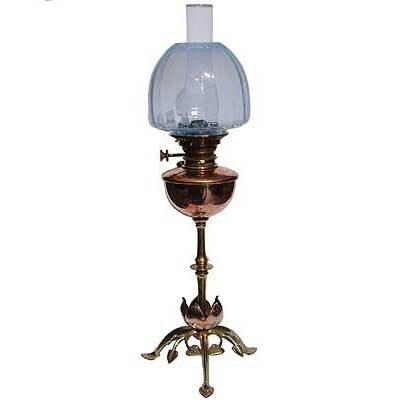 Arts & Crafts bronze lamp with leaded glass lamp, possibly by Handel. 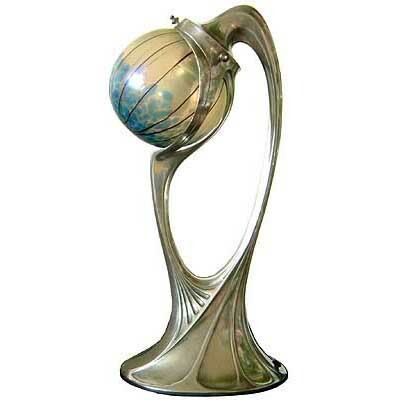 USA circa 1910. 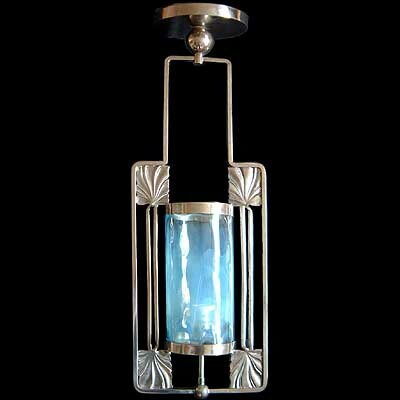 Note: damages to some of the panes but overall structurally sound. 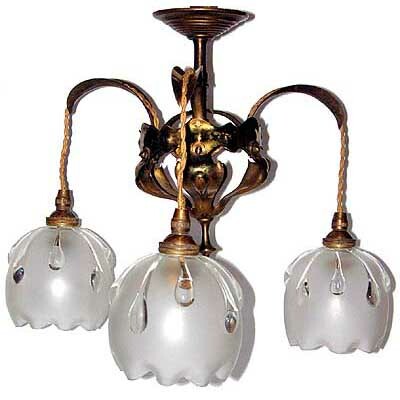 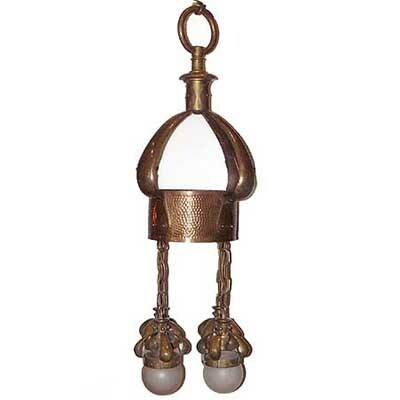 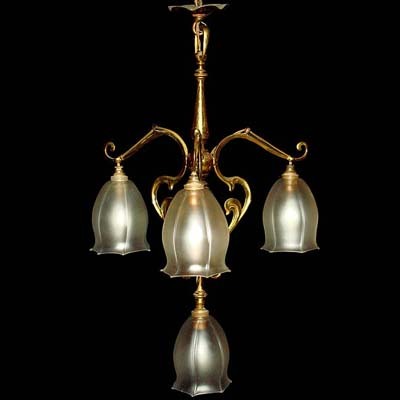 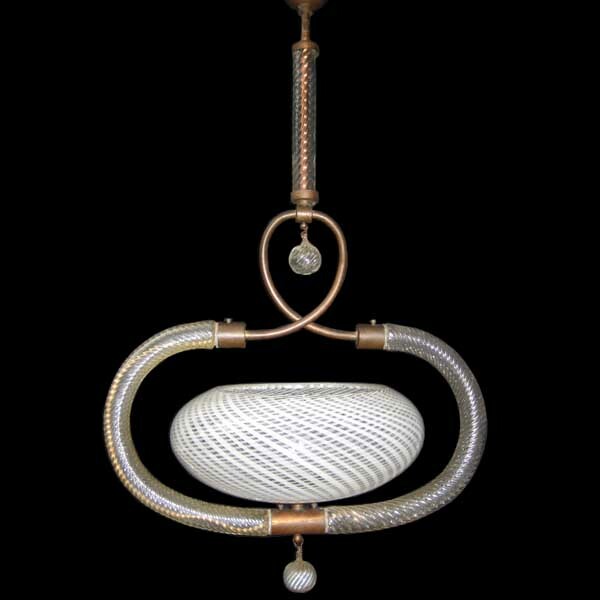 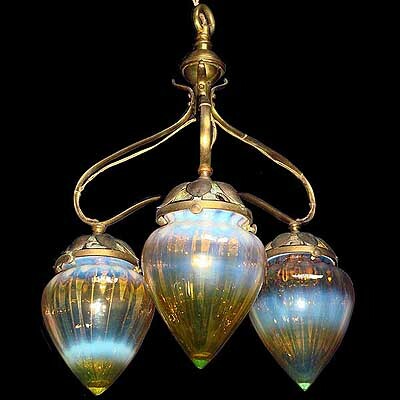 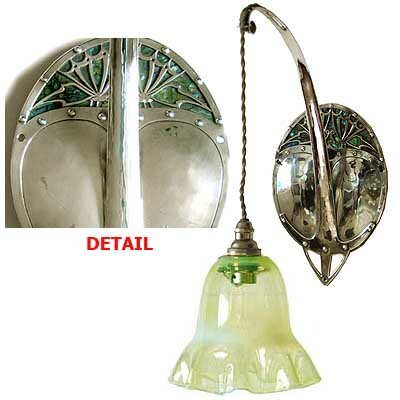 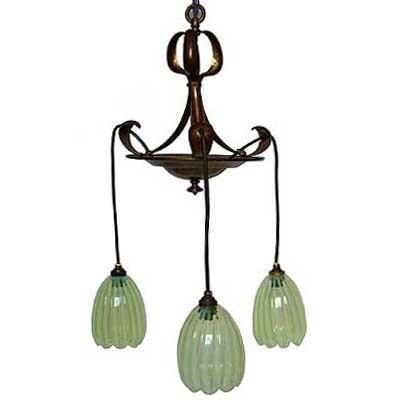 Arts & Crafts brass and vaseline glass ceiling light by the Birmingham Guild of Handicrafts, England c1900. 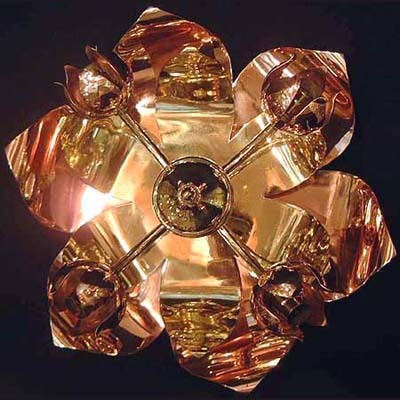 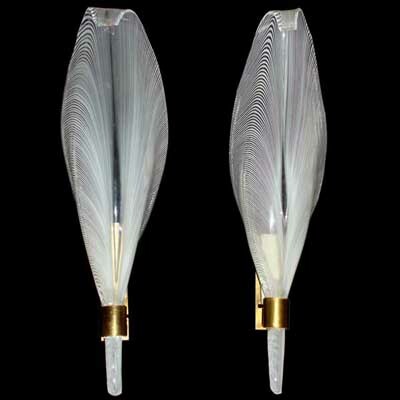 Pair of clear and peach coloured glass and brass Dahlia wall lights designed by Max Ingrand for Fontana Arte, Italy c1950’s. 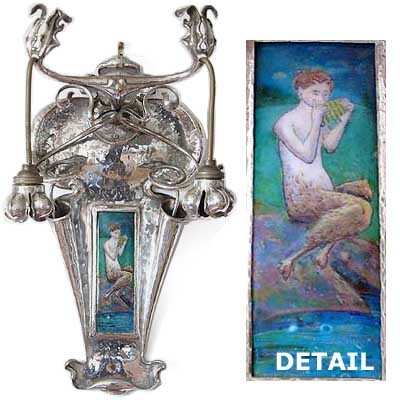 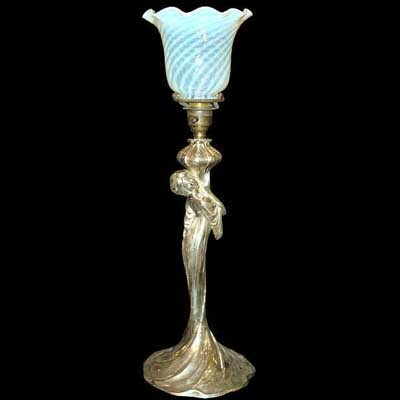 Large figural pottery lamp base with two Art Nouveau maidens holding a billowing shawl that forms the light shade. 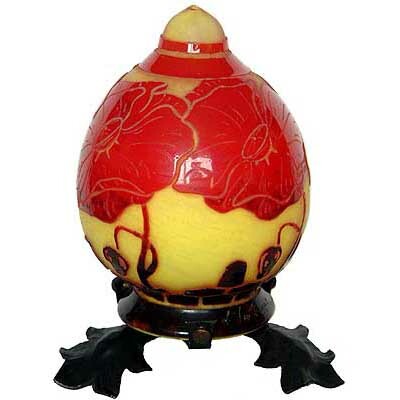 Modelled by Doebrich for Ernst Wahliss, Austria circa 1900. 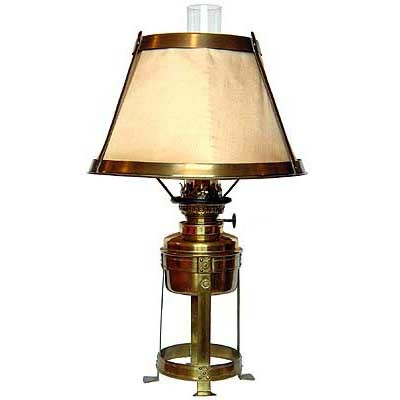 1950’s articulate brass and powder coated table lamp. 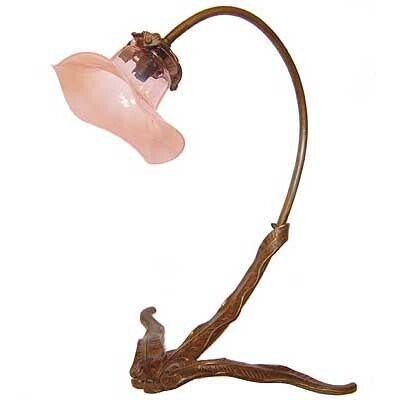 Rewired and ready for use. 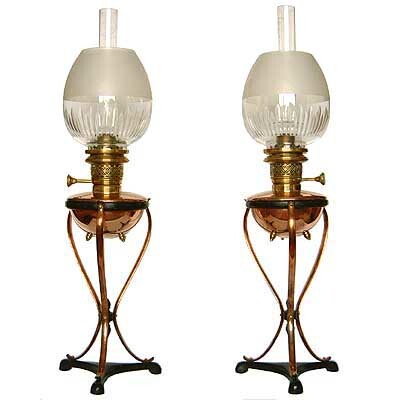 Art Deco leaded glass and bronzed spelter table lamp, probably German or Austrian c1920. 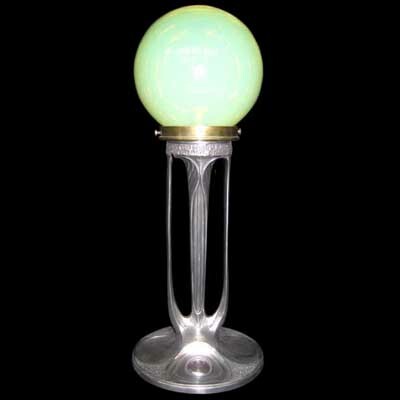 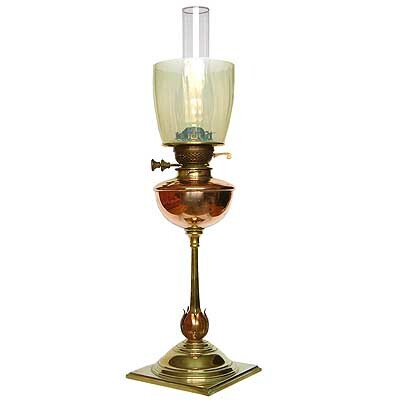 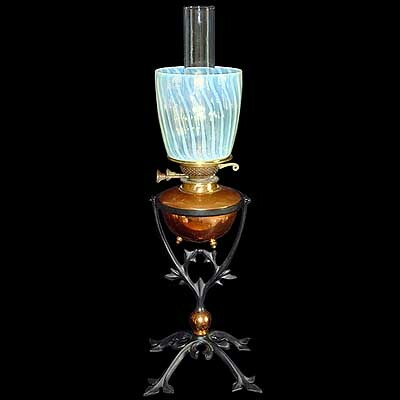 Art Nouveau bronze and Loetz glass table lamp with removable vide-poche insert designed by Gustav Gurschner and made by Arthur Krupp, K.K. 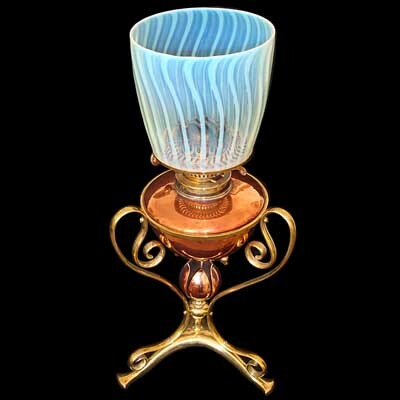 Kunst-Erzgiesserei, Austria c1900. 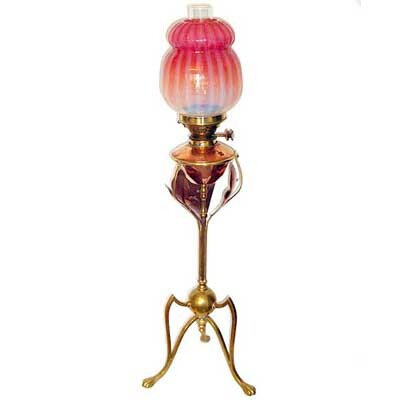 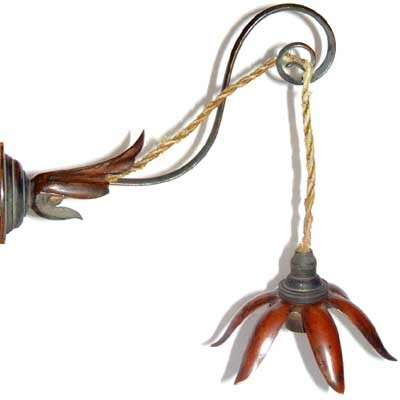 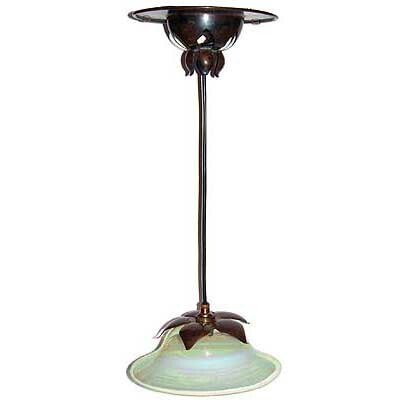 Art Nouveau bronze and vaseline glass adjustable flower form table lamp by Louis Majorelle, france c1900. 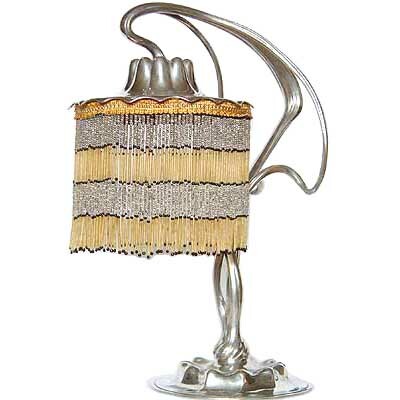 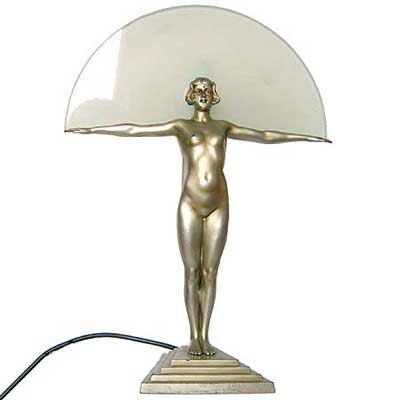 Art Deco bronze and glass table lamp in the form of a dancing girls stockinged leg by Fred Perret. 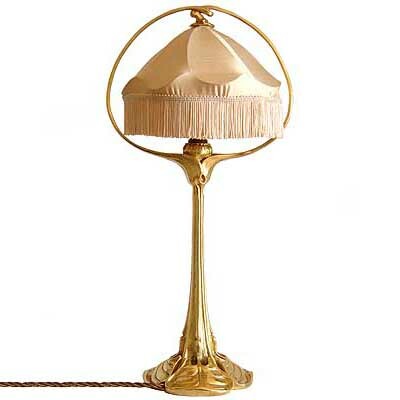 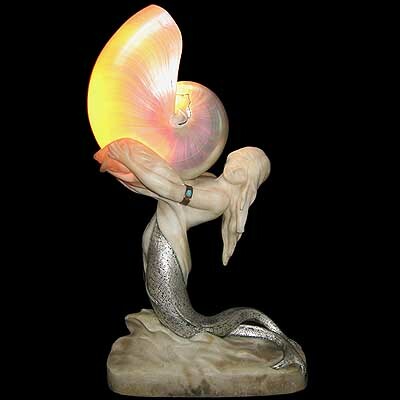 This lamp was made for Le Bal Tabarin, a Parisian club famous for its risqué cabaret between 1904-1953. 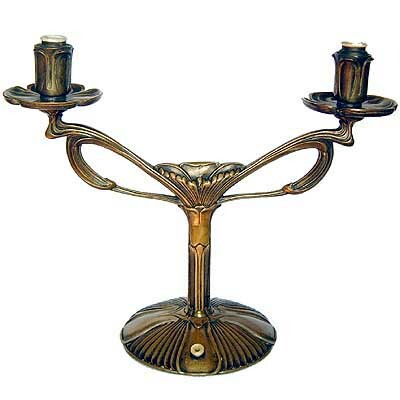 France c1920’s. 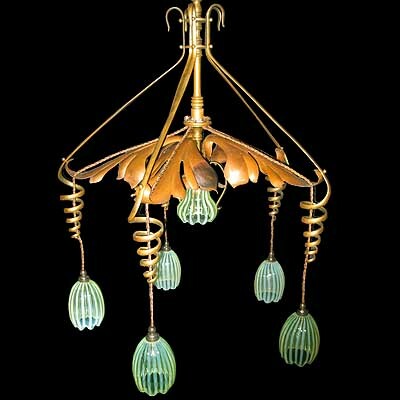 Arts & Crafts Amsterdam School brass piano lamp with Pallme Konig glass shade, Netherlands c1900. 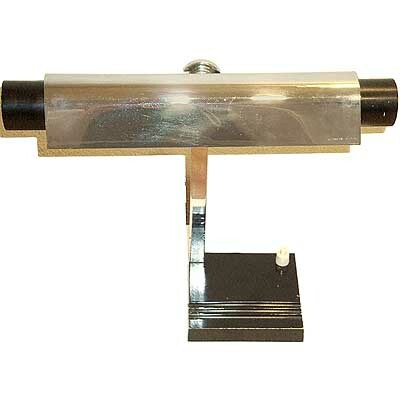 Made to overhang a piano, side table or display cabinet. 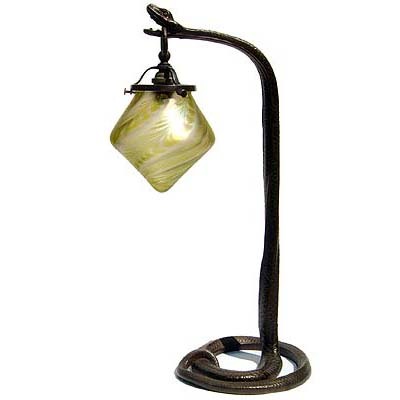 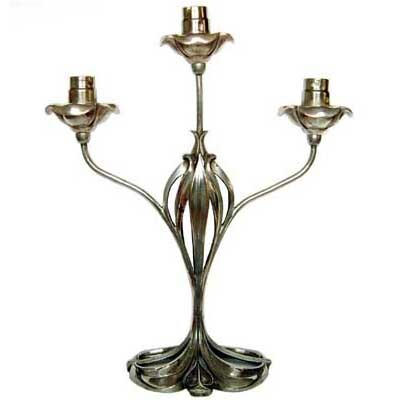 Art Deco wrought iron and moulded glass table lamp the base modelled as a tree by Henri Fournier, France c1930.